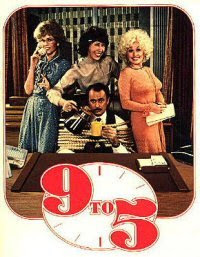 Working 9 to 5....umm wait. I work 4:30am to 1:00pm, scratch that 9 to 5 haha. Some of you have been asking me how work is going. Well here's the answer: GREAT! My co-workers are amazing! They are so funny and friendly. They back me up in my decisions, they support me and they make the time pass so quickly. The only hard part about work is getting up so early. I'm kind of getting use to it. The only think I'm not getting use to is missing my television shows that come on after I need to attempt sleep. Friday, I don't have to go in so early...which means I won't miss SouthLAnd. Is there anyone else out there watching that new show? It's GREAT! I love it! I hope it makes it and comes back in the fall. If you don't know, it's one of those mid season spring replacement shows. Alright since I have to be at work in about 8 hours and I have to get up before then.....my comfy bed is calling my name! Glad to hear that your job is going well! New jobs are always so nerve racking! Glad to hear your's is going so great! Good good good and I LOVEEE me some Dolly Parton! I haven't seen that show.. what network is it on? I'm glad the job is going well. It always makes life better when you have great people around you at work. That is a VERY early wake up time!! Glad it is going well! Is that an actual pictured of your coworkers? :) THAT would be awesome. Maybe you should tease your hair for fun. No, I've never heard of that show even...But thats not saying much seeing as I go weeks without even turning the T.V on...Don't you just love it when you find a job that excites you! Happy Wednesday! four thirty am... are you kidding me!? i would DIE!